Product prices and availability are accurate as of 2019-03-28 16:27:04 EDT and are subject to change. Any price and availability information displayed on http://www.amazon.com/ at the time of purchase will apply to the purchase of this product. 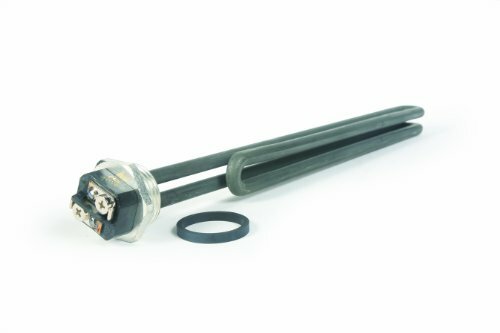 Camco's 2500W 240V screw-in foldback type Ultra low watt density water heater elements are better suited for areas with problem water (hard water, lime, etc.) Premium Ultra LWD Lime Life elements carry a limited 5 year warranty. Ultra LWD and special metal surface (high performance nickel-chromium stainless steel alloy) reduce chances of lime build-up. They resist dry firing and are ideal for problem water areas and locations with intermittent water supply. Screw-in type elements fit most models of American, AO Smith, Bradford White, Craftmaster (prior to 1991), GE, GS Wood (certain models), Kenmore, Lochinvar, Maytag, Mor-Flo, Reliance, Rheem, Richmond, Rudd, Sears, State, Whirlpool and all water heaters manufactured after 1994. The replacement element must be the same voltage and wattage as the element being replaced. Never exceed the nameplate rating on the water heater.